Tongariro is a volcanic complex in North island, New Zealand, that is made up of a number of vents and craters. 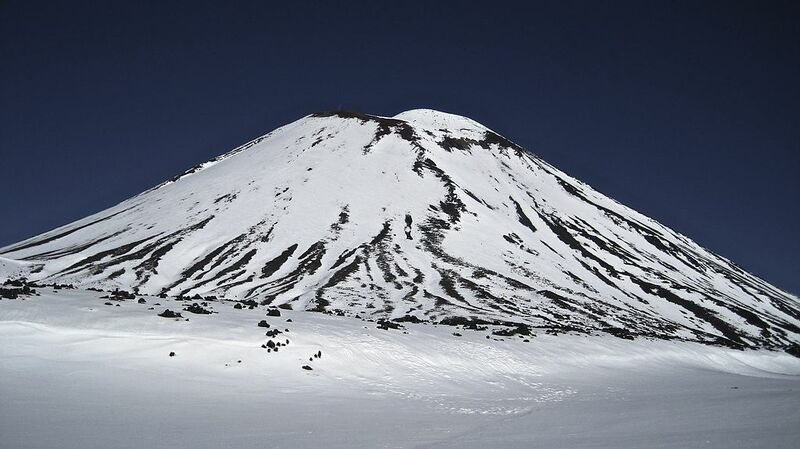 Several of these have been active in recent years: most of the activity in the past century has been at the steep cone of Ngauruhoe, but there was a small and unexpected eruption in 2012 at the Te Mari crater. Tongariro lies at the southern end of the Taupo Volcanic Zone, which is a chain of volcanoes forming above the zone where the Pacific tectonic plate is subducting beneath the Australian plate. The volcano is geologically young, and Ngauruhoe is one of the most active volcanoes in New Zealand. How does Tongariro stack up as a Top Trumps Volcano? Explosivity (Volcanic Explosivity Index) – 5. This is a volcano that can erupt with style. Height – 1978 m. Tongariro, and its close neighbour Ngauruhoe (2287 m) haven’t reached the lofty heights of either Ruapehu (2797 m) or Taranaki (2518 m), but its still a great place for a hike. Deadliness. 0. Recent eruptions of Tongariro have caused local damage, but no deaths. Wow factor – 52. This is a pretty spectacular volcano. Unpredictability – 34. For the moment, Ngauruhoe is frequently active, with many small eruptions in the past 100 years. Devastation Potential – 277. Volcanic hazards in the region are significant, with the potential for ash fallout, and lahars from melting snow. Nearby Ruapehu was the source of a major disaster in 1953, when the walls of the crater lake gave way, releasing a large volume of water which rapidly turned into a lahar. Downstream, the lahar swept away major railway bridge, moments before a passenger train arrived. Fun Fact – Ngauruhoe, which is the currently active volcano in the Tongariro complex, featured as Mount Doom in Peter Jackson’s ‘Lord of the Rings‘ films. Tolkein’s original idea for Mount Doom may have come from the Norse saga Ragnarök. The volcanoes of New Zealand are closely monitored by GNS Science, Te Pü Ao, who have some great webpages describing the volcanoes and their current status.